How can you tell if you're onto something good? Well, if you're like me, when you're in the middle of a great/exciting project, you can't stop thinking about it. When I am in a productive creative zone, I fight myself on going to bed and then once there, I have to fight the urge to get up and get working again. I push through all the "must do" work, until I can get back to my pet project again. So, what's my pet project? I'm redecorating the extra room upstairs. It went from spare bedroom to office, to catch all room, then a bedroom again for a few months when my sister moved in. Until recently when it became a completely empty room AND the perfect blank canvas. It started out innocently enough...I'll just paint. Then I decided to replace the outdated light fixture, so bought a cool looking chandelier. It's a small white, three light chandelier, perfect for my shabby chic style. 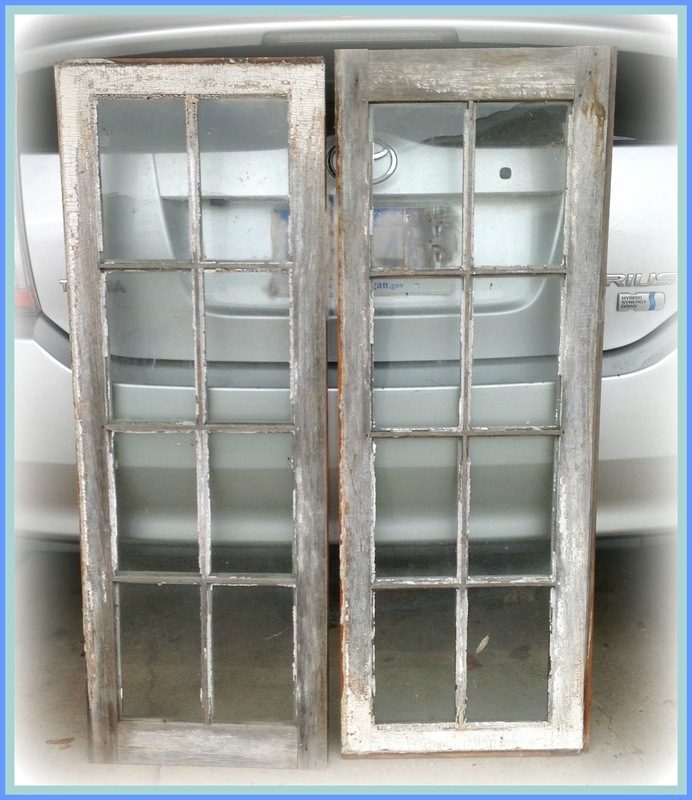 When I remembered that I have these wonderful old windows in storage! I could hardly wait to go check them out! As luck would have it they will work wonderfully! 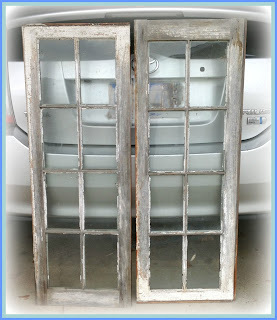 I put the final coat of wall paint on hold so that I could take advantage of a stretch of unseasonably warm weather we've been having, to clean up the old windows, which definitely needs to be done outside. A painstaking process, but just the kind of thing I LOVE to do!!! I still need to do some work on this window, the mullions need to be sanded by hand. But first, on to the second window, and the big clean up which I would like to complete before the true winter weather sets in. 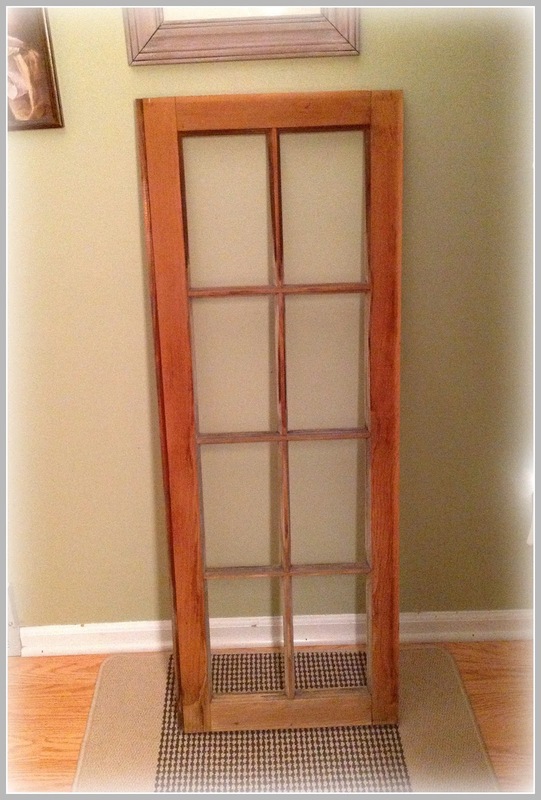 The two windows are a near perfect fit width-wise, but are 4" short lengthwise. Which is fine because I am brainstorming creative ways to jazz it up! I hope to have them done by next weeks post, I really want to move into my new room before Christmas! I hope you are having a delightful and creative week! I have shown you my house tree before. My house tree is actually two wonderfully twiggy branches that came down from my side hedge under the weight of heavy snow a few years back now. They had grown up, intertwined and fit together as nice as two puzzle pieces, so that when I set them in plaster in a pretty blue French flower bucket, they look just like one tree. I have been thinking it's time to change the decor. 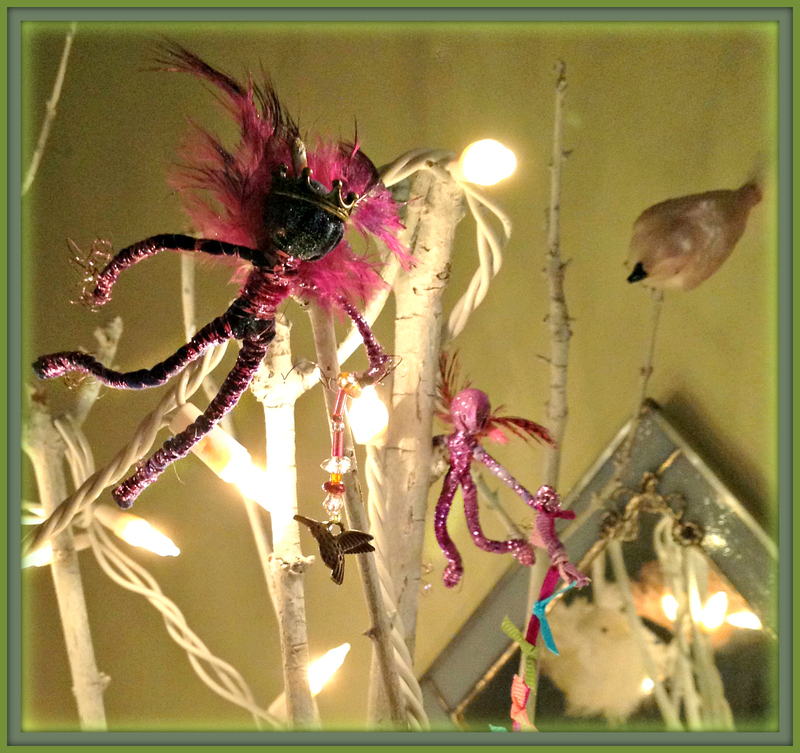 Over the summer a darling flock of chubby pink and white curly birds have been roosting among the branches. (You can see one reflected in the mirror.) But as the days grow colder, I think it will soon be time for them to fly to some warm, far away place for the winter. In their place I am making these cute, sparkly faeries to flit among the branches, two down, ten more to go! 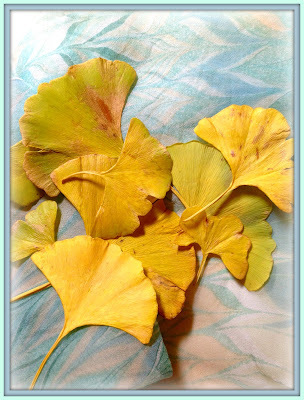 I am also going to hang these pretty golden ginkgo leaves, I'll cover them in a coat of protective resin first. The first ginkgo leaf came to me at the store the other day, it was such a beautiful sunny morning and I noticed that one had found its way into my cart. When I was leaving, I decided to bring it home with me, it felt like I aught to look up the symbolism. The symbolic meaning attributed to plants, flowers and trees is so interesting. I was pleased to find that the ginkgo leaf represents Love, Peace, Hope and Longevity, nice huh? A good little reminder for me, as it's been a bit nuts around our home lately. It is the time of year for falling leaves, so I went back and picked up a few more for decoration. I hope you had a wonderful week, be sure to pop over to Fiber Arts Friday and check out all the fabulous, creative folks at the blog hop! 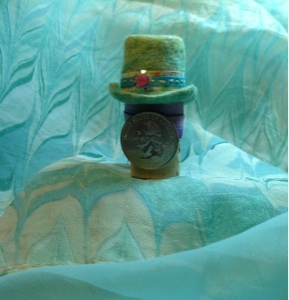 I have had this funny little idea percolating away for the longest time...a wet felted miniature top hat. Suddenly, it was time, a wee little top hat was waiting to be created. 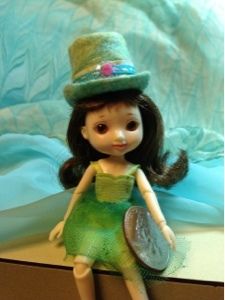 Originally I thought I'd make some for the faeries who live under the floor, they will not be left out, but this one is for my little doll friend Tika, it's to go with a fun party outfit I'm making her. 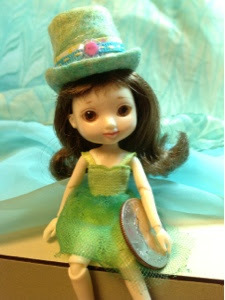 She loves the new top hat and looks so cute! (Tiny, isn't she? That's a quarter she's holding!) 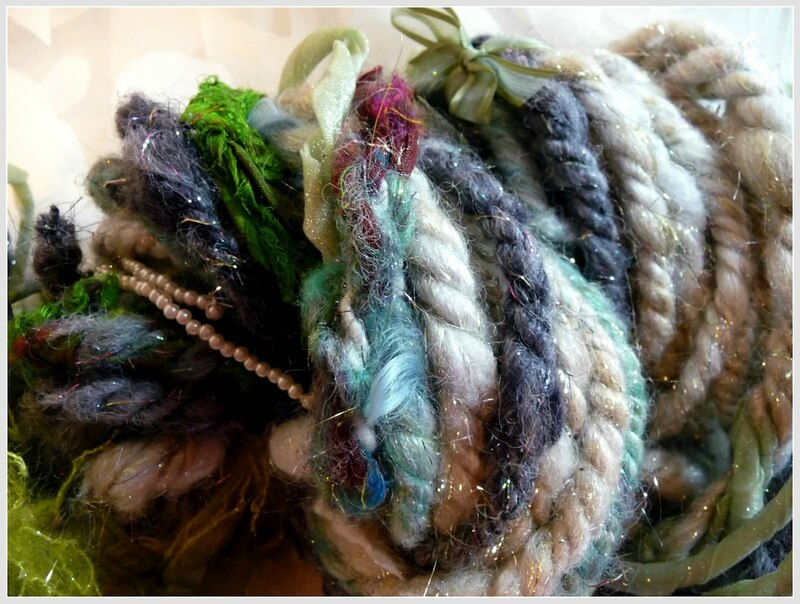 I have to give Heather at Wool love-functional fiber art a great deal of credit, she is so informative when showing her projects, that I'm always learning something from her extraordinary projects/tutorials and I was able to pick up some great tips for wet felting. 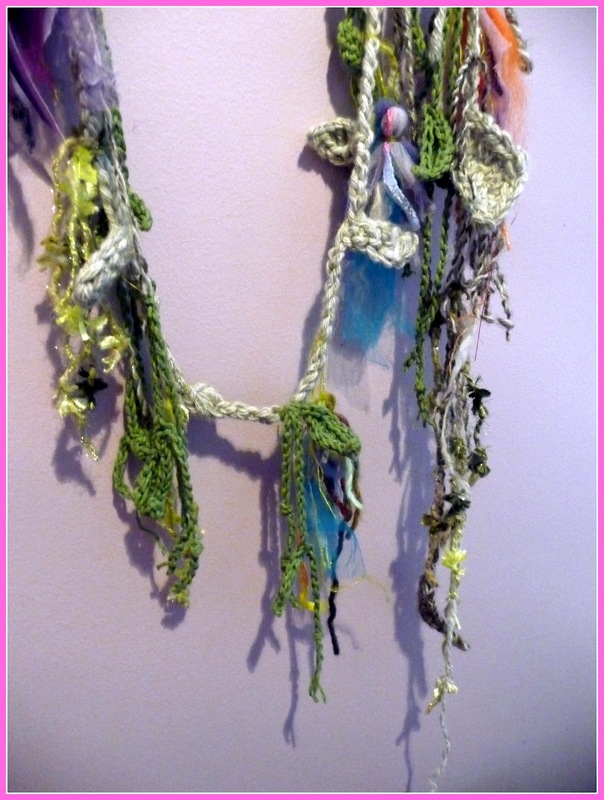 Be sure to check out this weeks Fiber Arts Friday over at WonderWhy, where there are always a lot of creative ideas to explore. 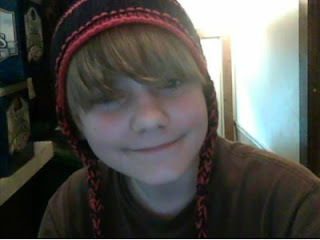 You may remember this UFO, a red and black flap hat for my great nephew. I finished it shortly after that post, but completely forgot to take a picture! My nephew was kind enough to accommodate me, and what the picture lacks in knitting detail, it more than makes up for with a pleasant, smiling (shaggy) kidlette. Just a wee little post, but I am happy to have kept to my goal of weekly posting! Hello there creative friends, I've missed you! I have been working away on lots of projects, despite my blogging absence, and I feel like maybe I've turned a corner here and can get back to regular posts. Fingers crossed! 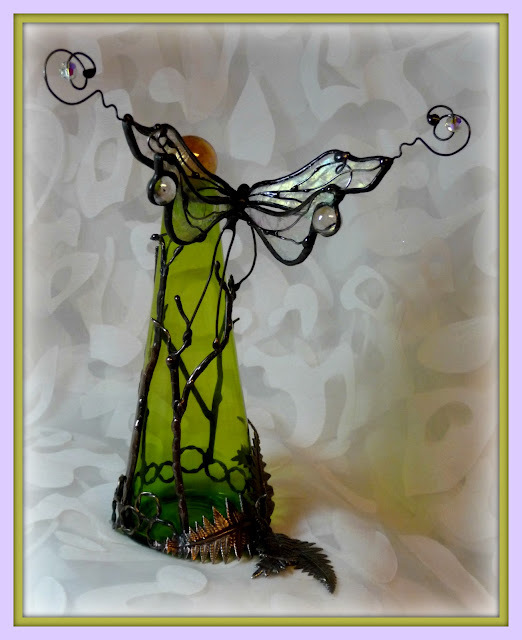 I've recently finished a new Faerie Bottle, it's a hand blown, antique glass vase in beautiful, shimmering green. I've made a pretty stopper from one of my treasured marbles and some glass jewels. 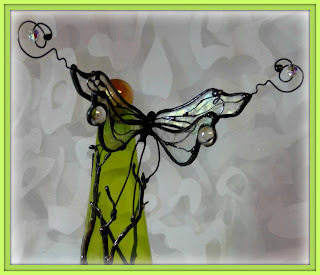 I am always combing the thrift shops and tag sales for pretty bottles and vases to use for my Faerie Bottles. 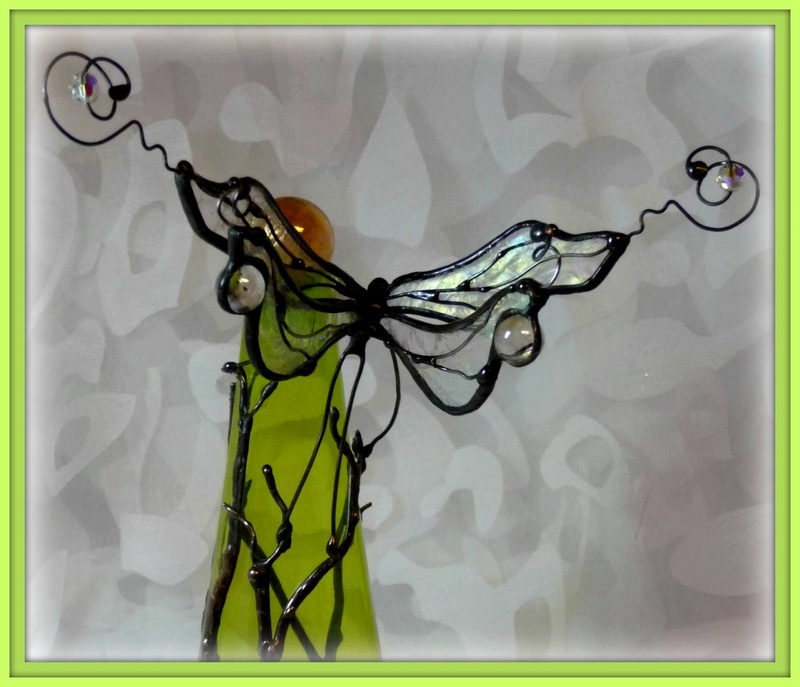 I've made the filigree on this bottle to look like knobbly twigs and the Faerie wings have jewels and Swarovski crystals. Here's a closer picture of the Faerie, I need to get some pictures from a different angle so the crystals show up better. So there you have it, my latest project. Thanks for stopping by, I am excited to catch up with all my creative blogger friends over at Wonder Why and Natural Suburbia, be sure to check them out! I was so excited to have an actual real-life sized project to post about this week, then somewhere between Thursday night and Friday Morning, I decided that Friday was only Thursday! When I did realize my error, blogger was going through one of its difficult periods. You know how it goes, I would get my picture where I wanted it, but the text was uncooperative and showed up as underlined no matter what I did, then while I was fuddling around trying to fix it...my photo DISAPPEARED!!! I thought to myself, ok blogger, I surrender. 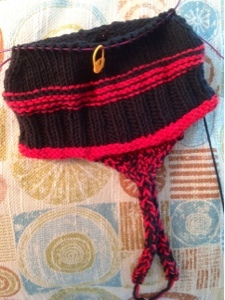 Here's where I am so far with the hat, it's a fast knit...unless you keep ripping back rows to make design changes. Because of this, I managed to extend what would have been a good, one night project. I've had to set it aside for a couple of days to do some tiny doll knitting for my shop, but I am in the home stretch as I begin the decrease rounds for the crown shaping, so once I get the chance to sit down with this project again, (hopefully) I will be in the home stretch and a happy young man will have his red and black flap hat! Blessings Friends, have a great weekend! I feel like my life has been topsy turvy for the last few months, I have been really out of sync. 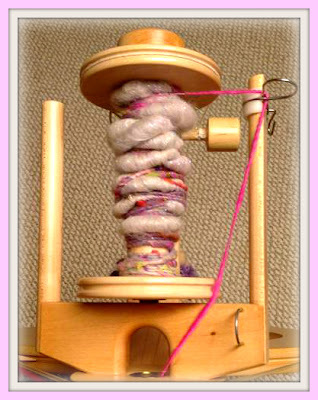 In an attempt to claim a little of myself back, I present to you a very scantly spun bobbin. 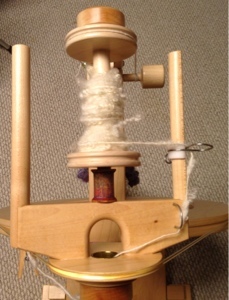 It may not look like much, I'm spinning Wensleydale cross lamb locks, but it's a good beginning. And as they say, a good beginning is half done. Have a great weekend, blessings friends! Though I was unable to spin even one tiny bit for TDF, I thought a lot about spinning. And finally, one nice day this week, I brought my wheel out on the porch and did some spinning! I really want to work on perfecting my cocoon spinning technique so that the spacing, and size are consistent and the cocoons are well constructed. One thing I have learned from earlier spins is that the cocoons really come together after the twist is set. 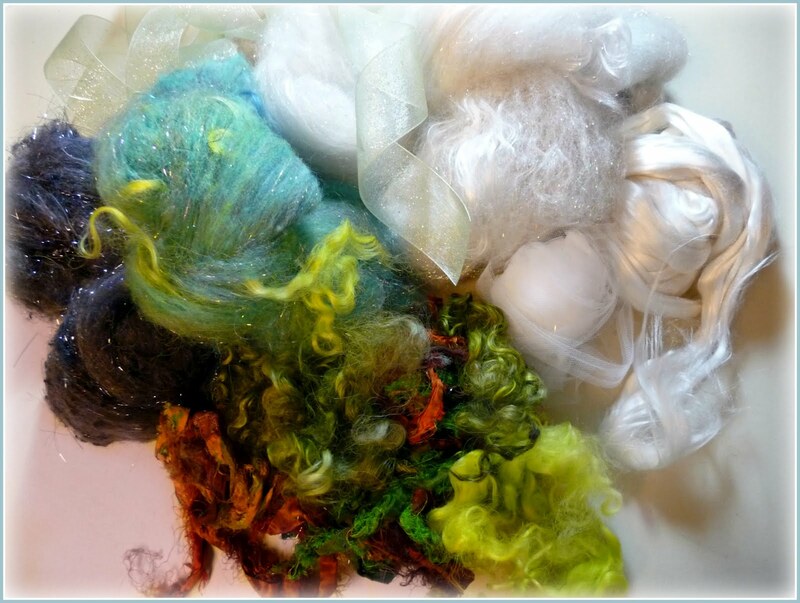 I carded up a very sparkly batt of fine fibers, smoothly carded for making the cocoons. (That is to say, I ran them through the carder more than once for a smooth fiber prep.) The color reads as white, but it's actually a silvery lilac. For my base yarn I am using several highly textured carded batts. 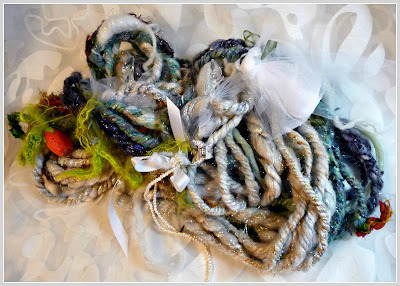 (textured = roughly carded but not super blended so that the resulting yarn is more textured than smooth) The base fibers include bits of yarn, sari silk, silk noil, wool neps, felted wool, among other fibers...aka the kitchen sink. 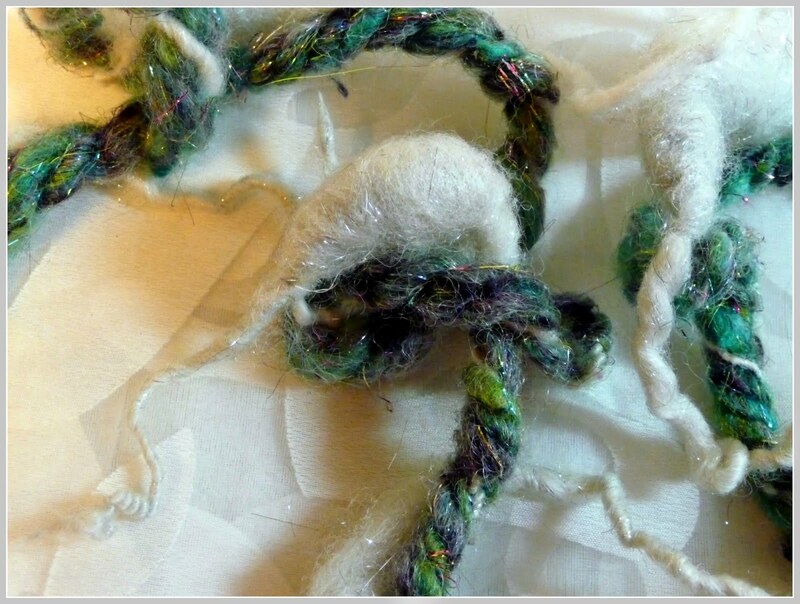 I'm not finished spinning this one yet, those cocoons are time consuming, but I feel like it's coming along. 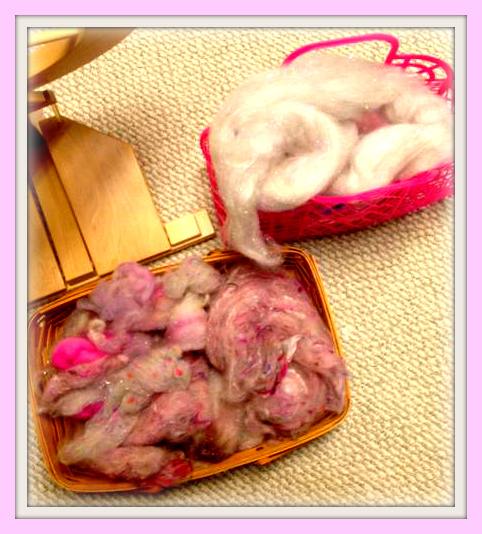 I'm pleased with the cocoons I've spun (mostly) and I love the contrast between the smooth and textured fibers. I hope you are keeping cool, have a great weekend. I had the idea to make a tiny crystal chandelier for Tika's flat. I love wire work and this project was especially fun. So much fun in fact that I didn't stop there, I made two chandeliers and a double candlestick lamp resembling stylized daffodils. Things are coming together in this tiny little space, we have a new table and chairs and I have made some pretty rugs too. The table and chairs were nearly a perfect fit. The chairs were made so that the seat was flush with the underside of the table. I fixed that by shortening them a touch, now they are the perfect size! Did you notice the little bedside table made out of match books? Little by little it's coming right along and I'm having so much fun! Have a great week, blessings friends! 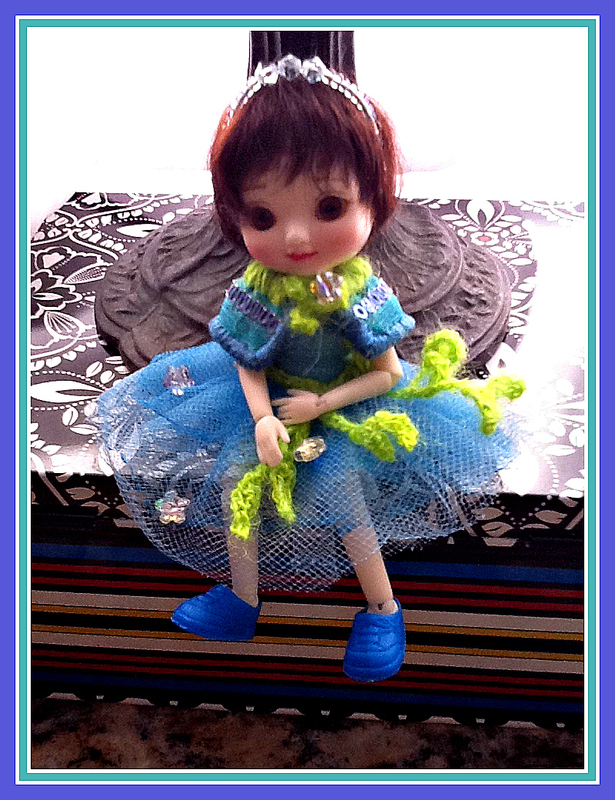 My little doll Tika is decorating her new flat. After seeing the dismal looking and very expensive furniture available out there, I decided to try my hand at making my own. Tika is so tiny, only 4 inches tall, by making the sofa myself, I was able to make it just the right size! I am happy with how it turned out, but I can see plenty of room for improvement, what do you think? Boy have I been mia, or what? It's been so busy around here, I just had to take a little break from posting. Now that it is officially a new month, I'd better get back into the swing of things! I'm still going to cheat a bit and do a short post. 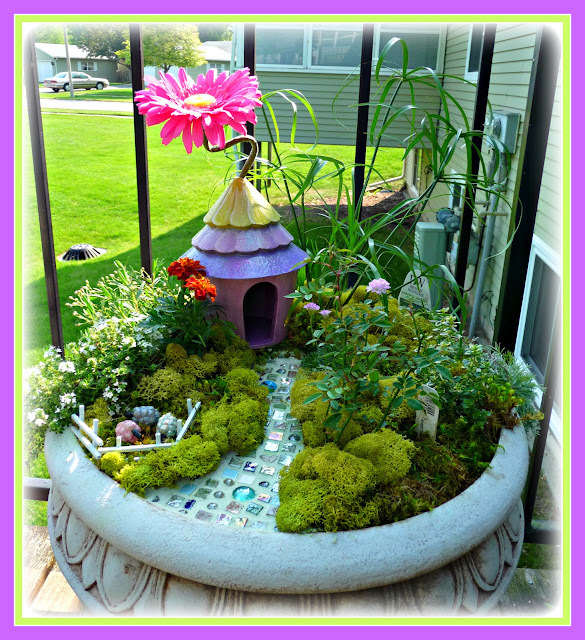 One of the many gardening projects I had on my list was making this faerie garden. I still have some tweaking to do, but it is mostly finished. The center piece of the garden is a Pink Fairy rose and I am quite excited to have found three tiny buds getting ready to bloom! 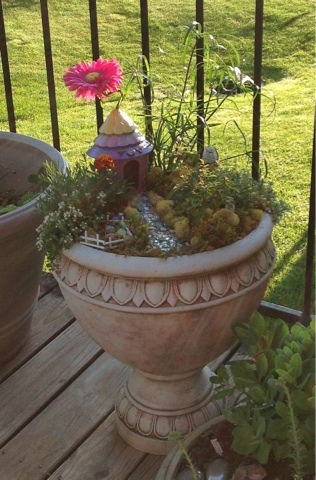 The other plants I used were lemon thyme, mother of thyme, pink baby's breath, silver mound and sea pinks. 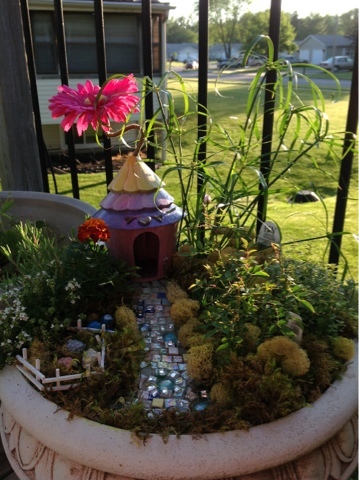 The faerie house was at one time a bird house I picked up at the craft store and cut out a door opening. I decorated it using sparkly faerie colors. I hope you notice that I also have some wee faerie sheep, I am hoping to attract some spinning faeries to the little garden and I am on the lookout for a faerie sized spinning wheel! I hope you have a delightful weekend! Blessings Friends! You might remember seeing Beth at Visions of Sugar Plums post about these cute little buns on last weeks FOF Blog Hop. I thought they were so cute that I wanted to make up a bunch myself. This is what's remains after the little (and not so little) kidlettes adopted their own bun to take home. This batch will be posted off to my little goddaughter. I know Easter has passed, but who doesn't love a little bun? 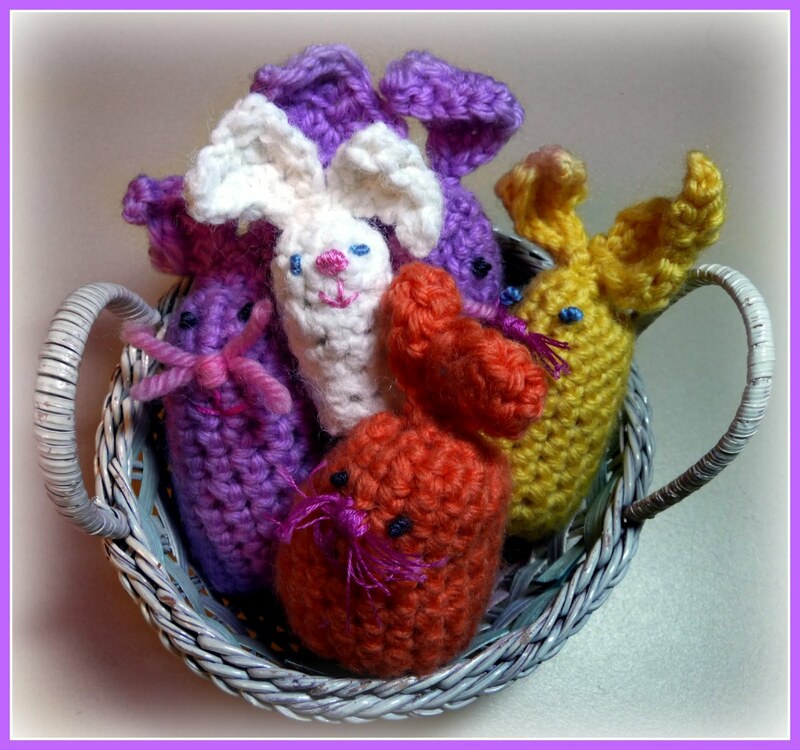 I had so much fun making the bunnies that I decided to branch out. 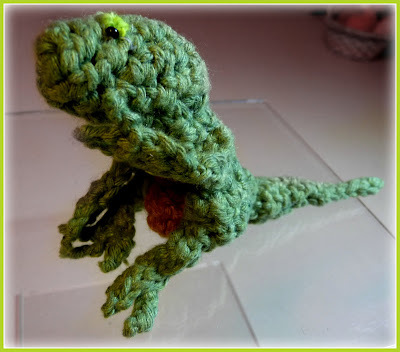 Another tiny friend of mine is absolutely crazy about T-Rex, and when I couldn't find a pattern I liked I decided to make up my own. 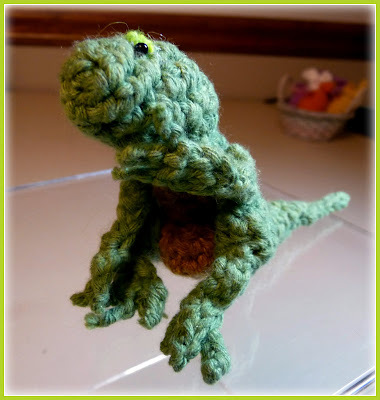 These are the first amigurumi (ah-mee-guh-ROO-mee) I've ever made, I have friends who love these little stuffed, crocheted toys, I see tons of their favorites over on Ravelry and I'm beginning to see why! They are super fun to make and a great way to use up scrap yarn. He's a thoughtful little T-Rex, thinking deep dinosaur thoughts. I'm sure if I send a little bun along in the parcel, he wont chomp on it...right? Be sure to pop over and check out all the fabulous bloggers on Wonder Why Gal's F.O.Friday! Blessings Friends, I hope you have a delightful weekend! I love making tiny things and a friend's new little doll was the perfect excuse to dive into making teeny tiny little clothes. My friend Marilyn is an avid doll collector and she recently added a petite 4" tall, ball jointed doll to her little doll family. The doll you see pictured is my slightly taller (and far, far, less costly) model doll. 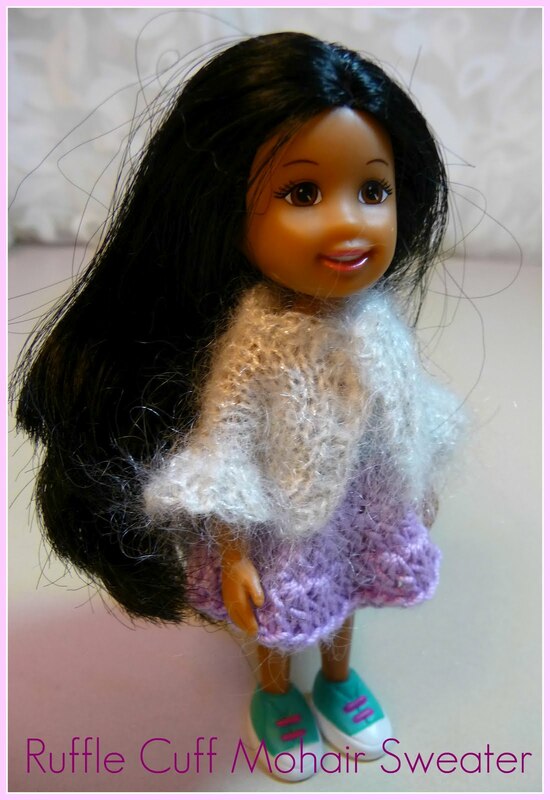 Last night I added a fashionable ruffle cuff sweater to the parcel of doll clothes I'll be sending along. I need to find some tiny pearl buttons. 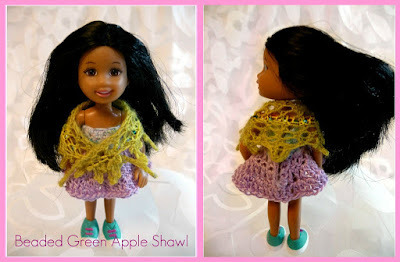 This was actually the first item I made, I love this apple green color! I added a row of tiny seed beads, they're not so easy to see in the photograph. Wednesday night it was ruffle bottom knit leggings. I hand dyed some mohair/wool blend Jagger yarn so that I could have a self striping yarn. I'm still patting myself on the back for getting the color bands on each leg aligned! Of course I had to make something a little faeriesque, lots of gauzy layers and sparkles in this one. 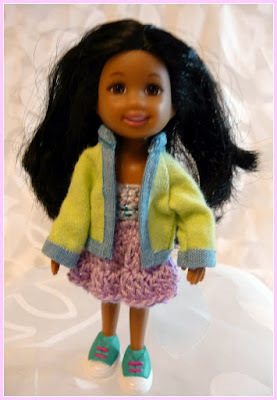 So there you have it, my adventures in making tiny clothes. It was so much fun! In the beginning I felt like I had baseball bats instead of fingers. I told my friend, what I need is a fairy sized sewing machine and some of that magical potion from Alice In Wonderland, but I sort of got the hang of it. And while they may not pass inspection by the critical eye of a professional seamstress, I think they'll do. Also, I wanted to update you on the fairy tale yarn I received. The story my swap partner spun for me was, The Elf Mound, you can click over and read the version she used when creating the yarn she spun for me if you like. I received my fairy tale swap parcel this week, all the way from Australia! I have been racking my little pee brain trying to figure out the fairy tale my partner spun for me. I am afraid I'm coming up blank, I was not very clever in figuring out the story. There are some significant elements in the construction of the yarn, namely the huge number of singles, which start off with two and progress to eleven, then back down to two. The two colors of the singles are a soft pale green and soft mossy brown along with silver and gold metallic threads. If you have any thoughts about what story this yarn represents, I would love to hear your ideas! I spent a lot of time looking at the yarn and pondering the tale it told. 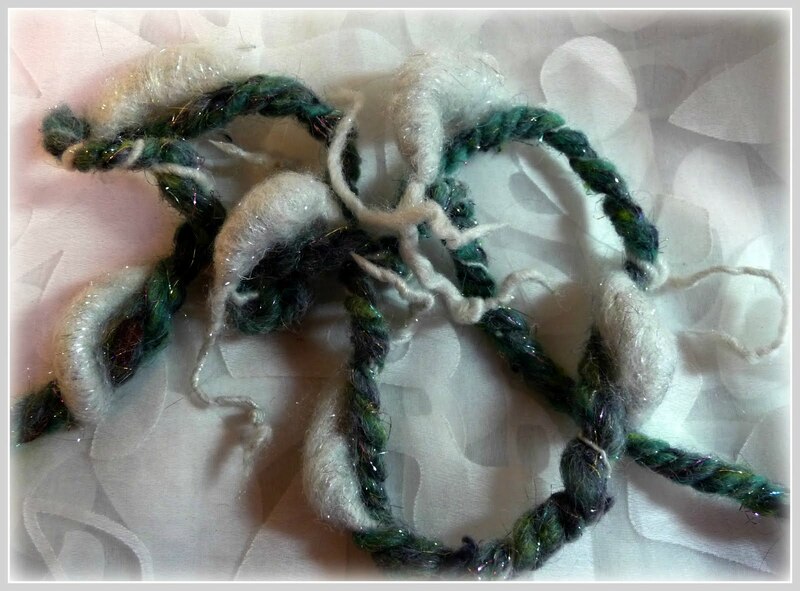 With the soft green and brown, plus all the finely spun, plied strands, it really reminded me of a beautiful twisting vine. So I followed that idea and crocheted a long vine with lots of random leaves, because I like random. The leaves were interspersed with bobbles which would become the centers of my crochet flowers. I also added some of my tassel flowers (Which I make using my spinning scraps and other goodies which are too pretty to throw away.) 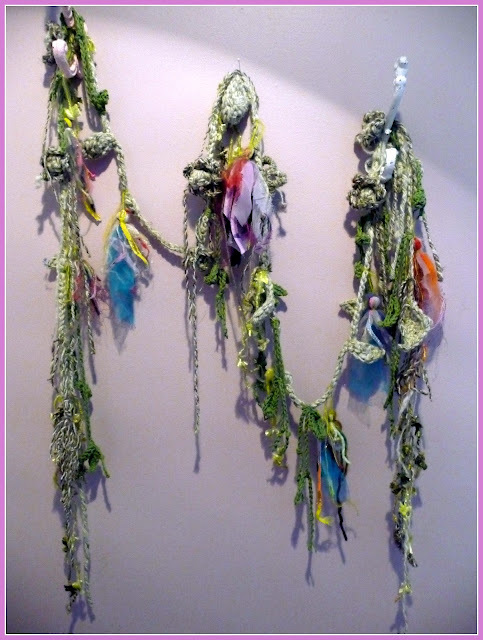 Plus some art yarn fringe randomly placed along the length of the vine, and some more fringe-like vines with leaves and buds, crocheted in a darker green recycled cotton. I'm thinking maybe the tower trellis in my welcome planter on the front walk could use a little yarn bombing in the form of an exotic creeping vine, or maybe I should just keep it as a lariat? I hope your week has been filled with wonderful creative moments! 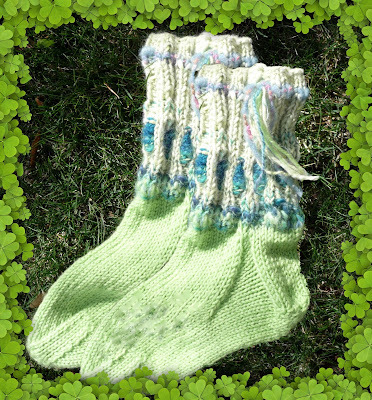 I worked furiously on these leprechaun socks so that I could have them finished by St. Patrick's day. Isn't it crazy how all of a sudden you get an idea to make something at the last minute! I had completed the cuffs in the green tweed without really thinking about it being close to St Patrick's Day, suddenly on Friday the idea to make them into leprechaun socks clicked in and I was knit-knit-knitting to complete them before the end of Saturday. I'm pleased with how they turned out, however they are too long, which is strange since it's my usual worsted weight sock formula. I wonder if it could be the yarn I used for the foot? While I like Cascade 220 (regular)wool, I am not crazy about the 220 superwash. It's a bit thin, almost like it's been stretched and doesn't have a lot of body. Why did I use it then? Well quite some time ago I had bought a bunch of it in all different colors for a class I was taking. I ended up buying different yarn and little by little I have been using up the superwash. It's a good carry along as a second yarn for color blending. But in this instance, it was really a case of it being the perfect color. I really do wish it were the regular wool, then I could full these down some in size. I think even the superwash could be manipulated a bit and might tighten up with a vigorous wash, but the cuff is knit with a wool/angora tweed, accented with my handspun and I know that would felt quite quickly. On the up side, this was the perfect color of bright green for my leprechaun slipper socks and I will simply pick open the toe and pull out a few rows and re-do the toe decreases. Or maybe I should unravel them back to the cuff and switch to a smaller needle and re-knit the entire foot? Fortunately I have some time to think about it since we have been having such delightful weather, no slippers are called for! I hope you have a lovely weekend and get in lots of creative time! I don't know about you but my head is swimming with so many ideas, I just don't know where to start! Must be spring fever! 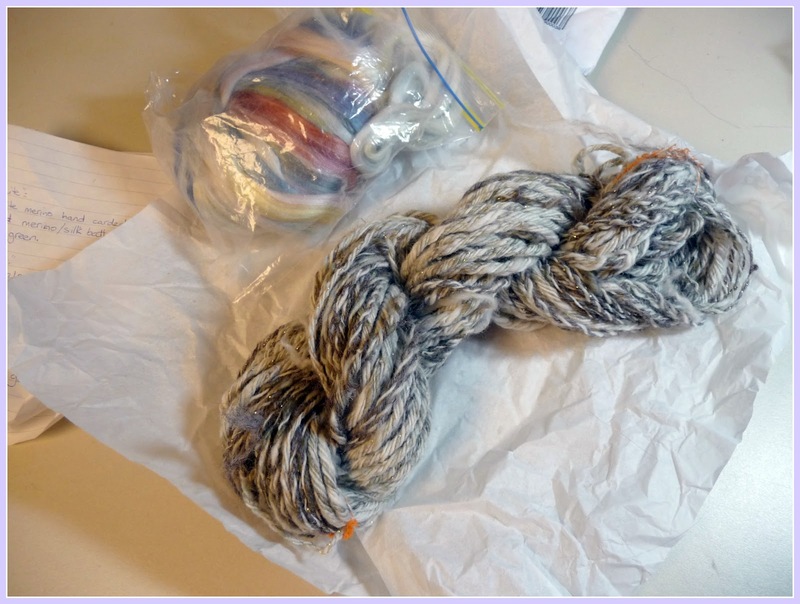 We had a fun fairy tale spin/swap over in the art yarn group and now that my parcel has been received, I can post details of the yarn and the construction. It was really neat to think about spinning the yarn to correspond with the story. You can see my beginning palette of fibers I put together for this spin. The beginning of story starts with cinders from the hearth, but even under the soot, the fine quality and character of Cinderella peeked through. 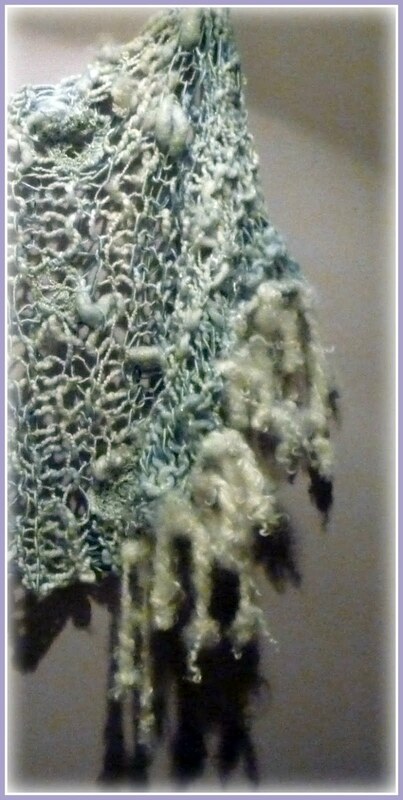 I used silk top, merino and silk noil to represent that part of the story, all dyed a smoky gray black. The perfect pumpkin for a magical carriage. I used sari silk ribbons in shades of orange and green,with their thick and frazzled edges plied with a mossy green single with tail spun Lincoln locks to represent the pumpkin vines, along with a dyed cocoon pumpkin. I made a little tassel/dress out of tulle. 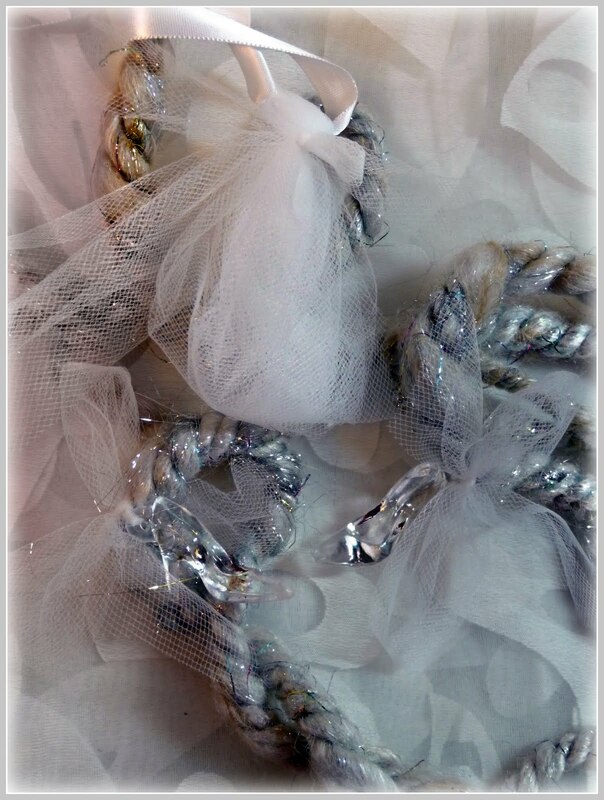 By leaving the loops uncut, adding a little tulle bow at the waist and a little length of the tulle for a train, I hoped to convey a tiny little ball gown. I also found some little glass slippers charms! Lots of silver and gold, sparkly magic going on here. 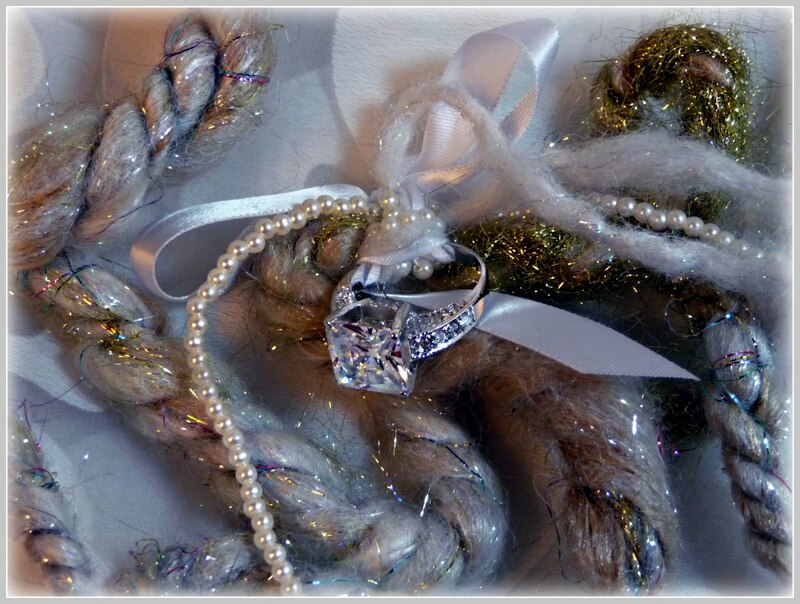 I found this huge sparkly ring, for total fairy tale style bling for Miss Cinderella's happily ever after moment! I added it into the yarn with beaded strands of tiny pearls and satin ribbons. Here's the whole skein. It was fun telling a story by spinning an actual yarn and I hope the fiber friend who received it didn't mind my very literal interpretation. I mean, even if nothing else is ringing any bells, those glass slippers are a dead give away! That being said, the parcel went to France and I have no idea if this tale is as common over there. Maybe some of my francophile friends can chime in with a little insight. Oh and check out this sweetie, my fluffy little bff (best fluffy friend) is 15 years old today! Everyone always asks me how old she is and I kind of ball park it because I can never remember for certain what year I got her, so I finally looked it up in my old file with the vet bills and it was 1997. The day itself is always easy to remember, since it's the day before St. Patrick's day. She is still so lively and playful. Happy Birthday Cissie! I hope you have a delightful weekend, enjoy this wonderful weather! 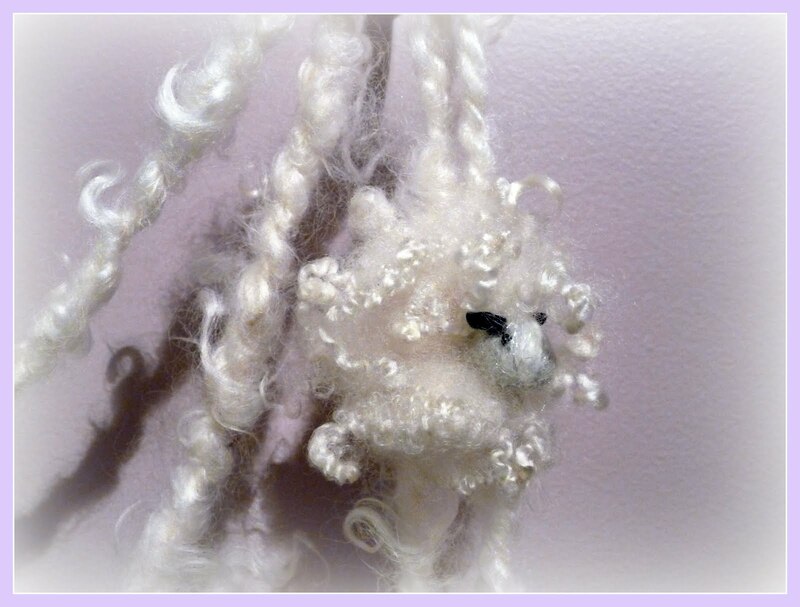 I have this stash of super tiny Wensleydale lamb locks that I have been hogging all to myself and I used some of them to make a little needle felted lamb of my own. I attached a pin back and made the curly little lamb into a brooch. 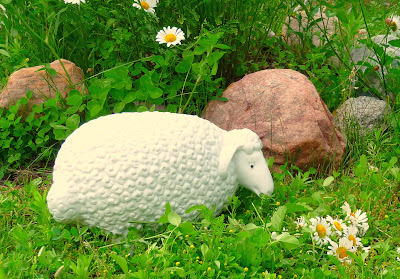 This is a needle felted ode to my favorite garden sheep Bramble. 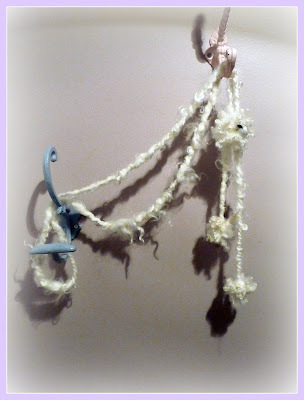 Then I had this idea to use the lamb brooch to make a lariat with some of my super chunky, lock spun (also Wensleydale) The nice thing is, they can be used together or are completely functional by themselves. 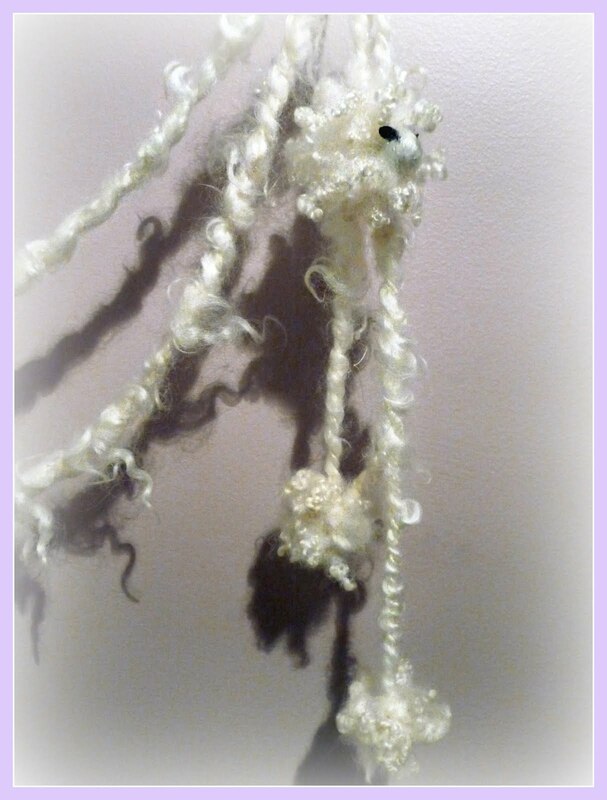 I needle felted some extra little curls at the end of the lariat to make some uber curly little pom-poms. The lariat is over 70" long, so there is plenty of length to play with different wrapping styles. It make the perfect little skinny scarf and while the lamb makes it playful, alone the lariat adds an artsy flavor. I'm off to check in with all the hoppers..err, posters on Wonder Why Gals FOF blog hop, I love all the creative ideas and projects, check it out! Have a delightful weekend...watch out for the sun spots! 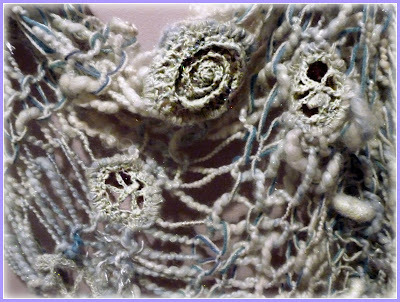 In addition to the wheel motif I showed you last week, I also included a cosmic spiral motif, both design elements were freeform crochet on a knitted base. I like to incorporate symbolism into my work where I can, and both of these designs are positive symbols throughout many cultures and carry a timeless, universal message of unity, balance, centering, growth and connectivity. Ahhh, that luscious Wensleydale yarn, here's a closer look at the fringe, it's beautiful and very sheepy with all the sproingy little curls! It's nice and long, and has a good drape, but it's also light and airy. 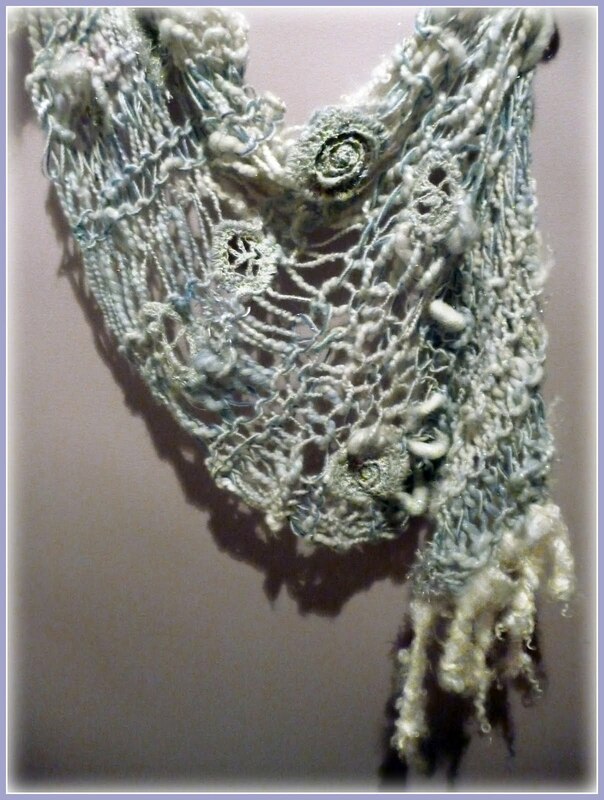 It would make an excellent traveling shawl. 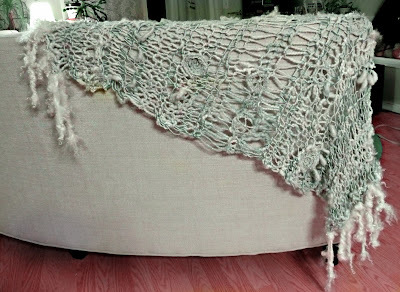 A very cozy, curl up with a good book shawl. 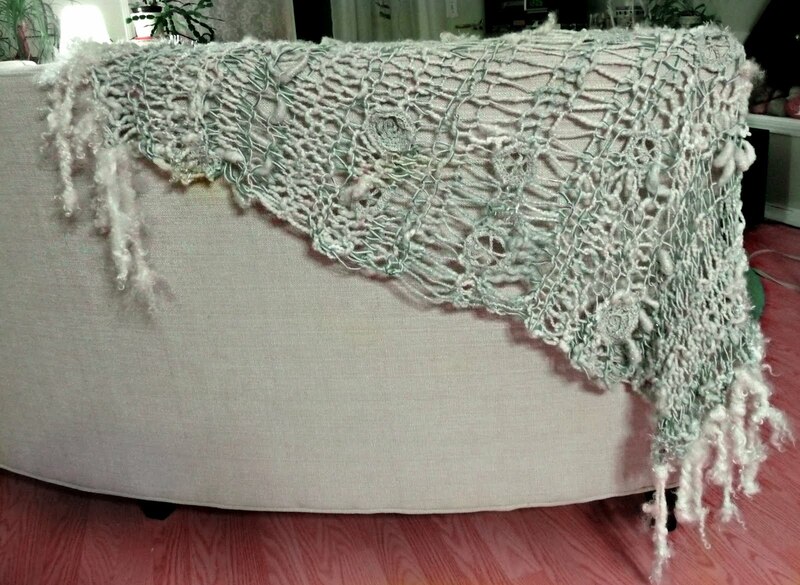 A comforting, nurse you back to health shawl. And the best, walk outdoors on a spring day shawl. 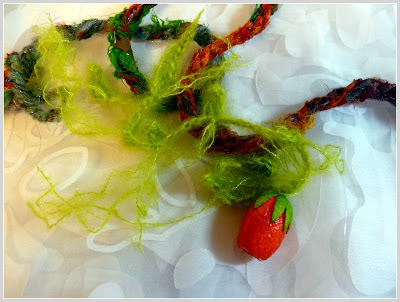 I look forward to seeing all the yummy projects my Fiber Arts Friday friends have been working on this week, I love Andria's FOF blog hop, if you haven't already, check it out, you'll find lots of creative inspiration!